Posted by leskanturek in Artists, Guest Visits, Public art. As you step off the train at 110th Street and Lexington in the NYC subway, you find yourself face to face with the art of Manny Vega. 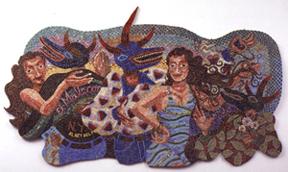 four panels, each approximately four feet high depicting scenes of life in the barrio lovingly, painstakingly crafted in mosaics. Un Sabado en la Ciento Diez (A Saturday on 110th Street). 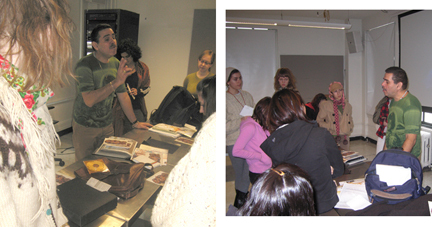 Manny took some time out to stop by class this last spring semester to talk about his work, and the process of creating art for the subway and the public. Manny is a self taught craftsman but also an obvious sponge for any knowledge of his craft. In terms of the 110th st. commission I was struck by the relatively short time frame it took him to accomplish such a laborious process. Months versus what I assumed would be a minimum 2 year process with execution and installation. (Above) Portrait of Julia de Burgos. East 106 Street between Lexington and Third Ave. Julia de Burgos was a Puerto Rican poet and civil rights activist who died at 39 in 1953. Photos by Librado Romero of Manny and his work and audio of Manny speaking about his mosaics and philosophy.